Updated: HDMI version numbers are history | What Hi-Fi? HDMI Licensing LLC, the body responsible for the High Definition Multimedia Interface (HDMI) standard, has today made the 3D portion of the HDMI specification version 1.4 available for public download on the HDMI website. The HDMI consortium will release a 1.4a version of the HDMI spec shortly which will include updates for 3D TV formats. "As the mainstream adoption of 3D is gaining momentum and content providers define and expand their 3D roadmaps, HDMI is ready to support this major market development," says Steve Venuti, president of HDMI Licensing LLC. To help accommodate broadcasters, the HDMI Consortium announced a change in its licensing restrictions in December 2009, in order to allow 3D broadcasts to 3D HDTV sets over HDMI v1.3. This permits operators like Sky to deliver a firmware upgrade to its Sky+HD boxes to allow 3D delivery without having to adopt HDMI 1.4. The PS3 games console falls into the same category. It's interesting to note that the official licensing body is still referring to HDMI 1.3/1.4/1.4a in its press release, even though it has decreed that all reference to numbered versions of the HDMI standard should be removed within the next year (see our original story below). Originally posted 04.01.10: The HDMI licensing agent has announced some further additions to the HDMI specification regarding 3D TV formats. 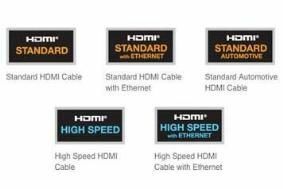 The HDMI Consortium will meet later this month to add an additional 3D format, currently being referred to as 'Top/Bottom', to the HDMI specification, meaning this format will be supported by the HDMI system. In addition, the HDMI Founders have clarified – it says here – 3D via existing digital TV set-top boxes. At the moment such boxes are required to meet HDMI v1.4 requirements for 3D even if only implementing one or more 3D formats, but the HDMI licensing people have now decided that such boxes need not implement the mandatory HDMI 3D formats. This will be re-evaluted as and when a mandatory 3D broadcast system is defined. Originally posted 21.11.09: Just when you thought you understood what HDMI v1.3 or v1.4 meant, in terms of cable and equipment specifications, HDMI Licensing has ruled that companies using its standard can no longer refer to Version 1.4 whatsoever, and have a year to remove all other version numbers from their products. Still with us? For products other than cables, version numbers are also to be phased out by the start of 2012, meaning that the likes of switchboxes can no longer be described as supporting v1.3, for example, or TVs be said to have v1.3 inputs. Until January 1, 2012, the HDMI version number can still be used, but "only when the Adopter clearly specifies the feature or features associated with that HDMI version number." As already mentioned, there is a one-year grace period for the implementation of most of these changes, and we'll be amending our technical specifications accordingly over the coming months.